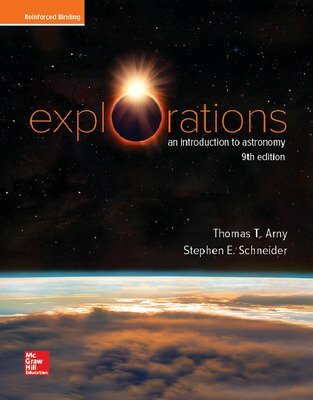 In the 9th edition of Explorations, the sense of wonder grows deeper when we begin to understand why things happen by offering explanations that draw as much as possible on simple, everyday experiences. This approachable text goes beyond merely saying, “This is how it is.” to create concrete connections by using engaging, interactive features, analogies, and examples from the world around us to help students understand more complex content. When we can link physical principles to accessible, real-world observations, many of the more abstract and remote ideas within astronomy become more familiar. • Animations and Interactives, available with the online at My.MHEducation.com, to help students grasp of key concepts. • Projects indicated in the eBook by their own icon and activities that promote a better understanding of the wide variety of astronomical ideas and how they connect them with what is visible in the sky. • The Foldout Star Chart at the back of the book for studying the sky and figuring out where the Moon and planets are located in any month. • The Cosmic Periodic Table that graphically illustrates essential information on the atomic elements that is critical to understanding their role in the cosmos. • Science at Work boxes discuss ideas that demonstrate how scientists examine new hypotheses. • Looking Up figures, are located at the start of the book. These images of the night sky show students how some of the astronomical objects connect with the real sky that they can see overhead at night.